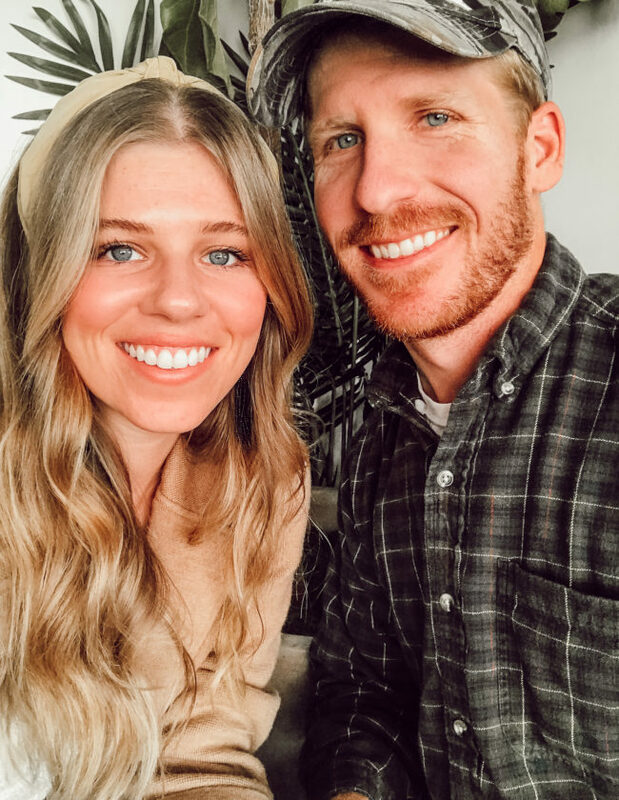 Joshua is joining me today to share spring date ideas! Including five he really wants to go on. Happy Friday y’all! 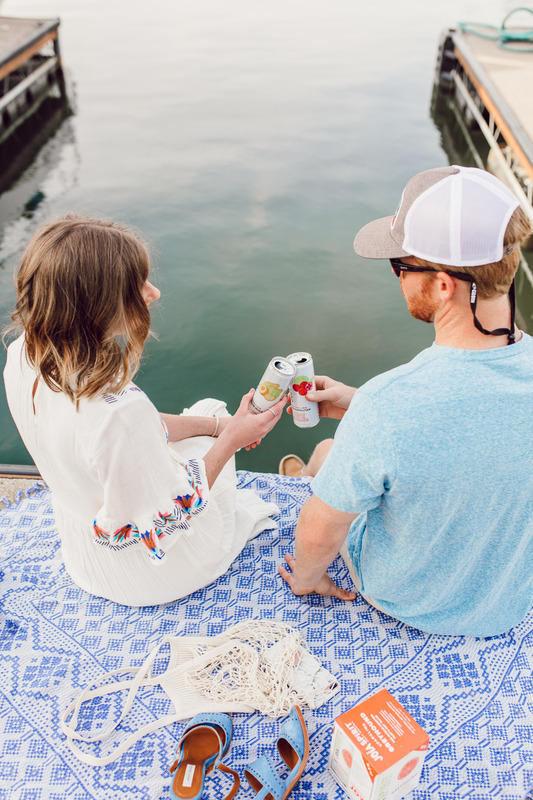 Today seemed like the perfect day to share spring date ideas since we are just mere hours away from the weekend. And if we’re lucky, Mother Nature will cooperate and give us spring temperatures + sunshine. I’m so excited to have Joshua joining me today to share some spring dates he actually wants to go on. Because let’s be honest ladies, when we plan dates, we don’t always have the men in our lives interests at the front of our minds. That romantic dinner spot, rom-com, or wine tasting might not be 100% up his alley. Now we all know relationships are about compromise, so I’m sharing five spring date ideas as well. 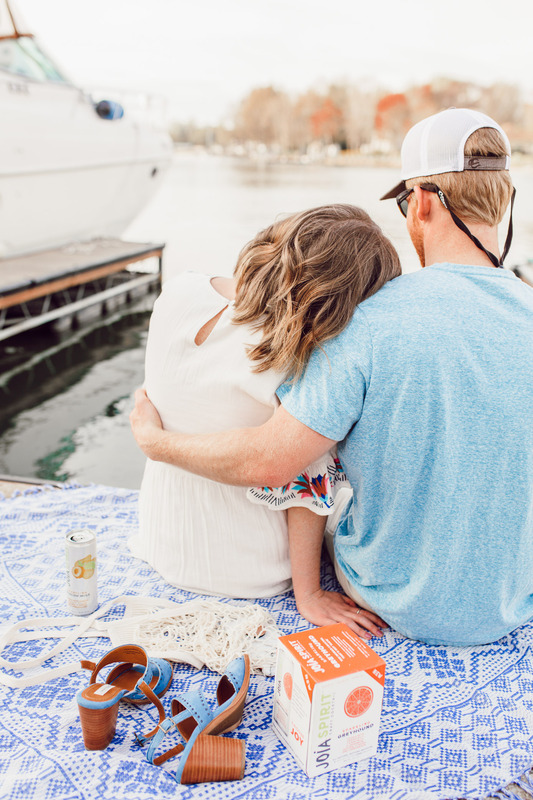 However, I’m almost certain you both will enjoy all ten of these spring date ideas! Picnic in the park with the classics – peanut butter & jelly, fresh fruit, and your favorite cookies (Oreos for me). Then an afternoon nap in the sun to follow. 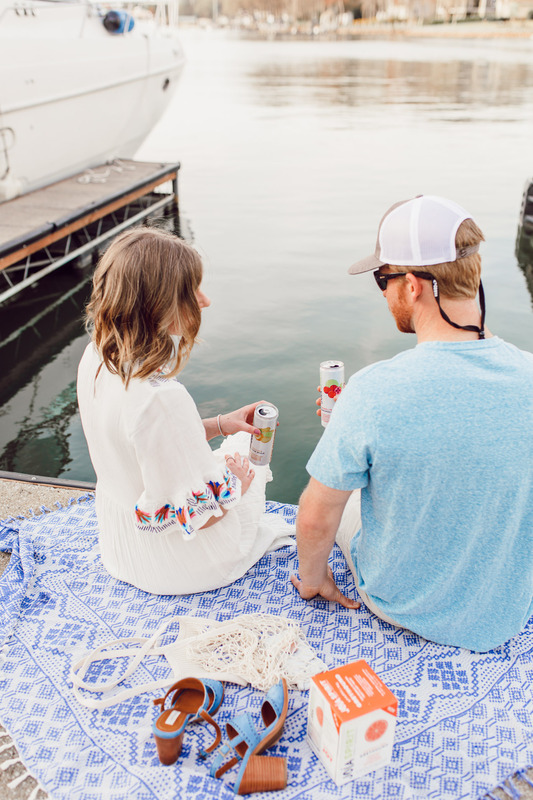 Find a spot by the water, bring your favorite drinks, and watch the sunset! We recently did this while enjoying Joia Spirits – Moscow Mule for me, Cosmopolitan for Joshua. 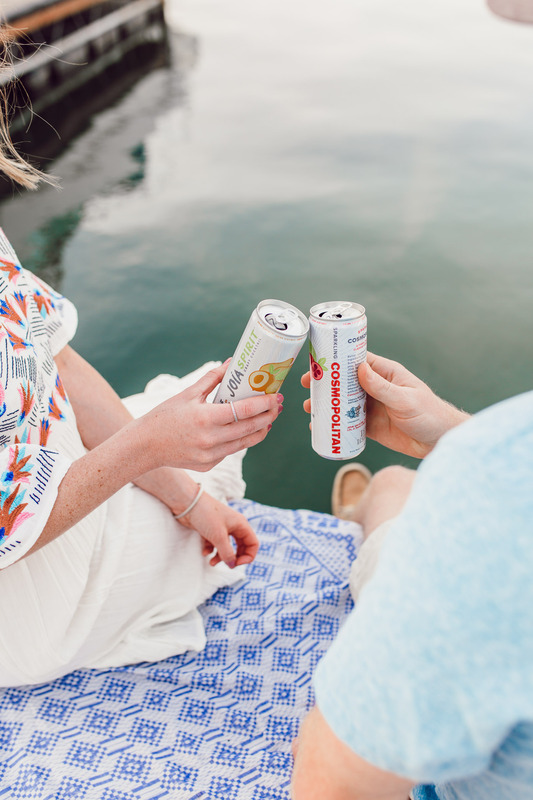 These premium vodka cocktails were the perfect way to enjoy a spring evening by the water. 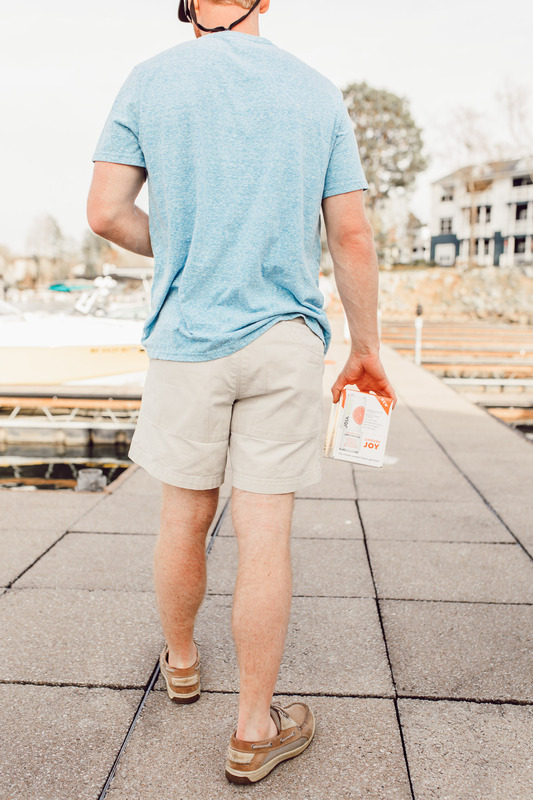 Fresh flavor, all natural, and amazing taste! Visit a local garden. Everything is starting to bloom and by mid-spring everything will be! Time to soak it all in and enjoy the slightly cooler temps while doing so. Enjoy all those beautiful flowers April (really March this year) showers bring! Go for a drive with the windows down. Explore a nearby town or a cute spot of town you’ve been meaning to check out. Point out which houses you both love and stop in to dine at one of the local spots. If you’re local to Charlotte and looking to explore – check out Davidson, Belmont, McAdenville, Waxhaw, or Matthews. Find a recipe you will both enjoy and take a stroll through the local farmer’s market. Pick up all the ingredients you need to cook your new recipe. Plus the prettiest spring blooms to fill the table. From your sweetie, of course. Go for milkshakes at your local diner or soda shop. For us here in Charlotte, that’s either Pike’s Old Fashioned Soda Shop or The Soda Shop in Davidson (Laura Leigh’s favorite). Go for a hike on Sunday or Saturday afternoon and end with drinks. If you’re local to Charlotte, I recommend the U.S. National Whitewater Center or Crowders Mountain. Both offer great hikes. Celebrate finishing your hike and enjoy the outdoors a little longer by indulging in a mobile cocktail. Try one of our favorites, Joia Spirits Moscow Mule or Cosmopolitan. Visit your alma mater. If you live close to your old stomping grounds spend an afternoon walking around the campus. Talk about college life and stop into the dining hall or student union for lunch. Bring a blanket and lay out on the lawn. Relive those glory days. Attend a NASCAR or dirt track race. A total guys date but hey you have to cater to us sometimes, right? Don’t knock it until try it. You just might turn out to be a fan like Laura Leigh. For both NASCAR and dirt track races you can usually BYOB so pack a personal cooler full of your favorites. Joia Spirits Moscow Mules or Greyhounds would insanely refreshing while sitting out in the sun. Make a bonfire for two. Don’t forget the s’mores ingredients! Graham crackers, Hershey’s chocolate, and marshmallows. And if you’re Laura Leigh, Oreo’s as well (in place of the graham crackers). Make sure you have a blanket or to as well so you two can wrap up after the sun goes down. So there you have it, ten spring date ideas from him and her! Hopefully our ideas provided you with some inspiration and you’ll be marking some spring dates on your calendar stat! Maybe even this weekend. And if you’re in the need for some cocktails, don’t forget to pick up Joia canned cocktails. They’re perfect for bringing with you or enjoying on the back porch of your home. They make things easy so you can focus on your date, rather than whipping up a cocktail from scratch. Drink these pre-made cocktails straight from the can or get a little fancy, pour into a glass add ice and a cute straw. 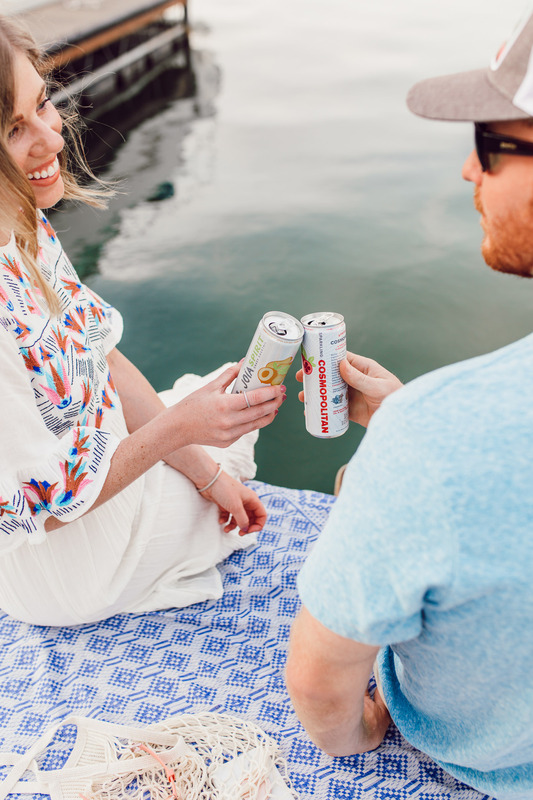 Cheers to spending time with your love while soaking in all spring has to offer! And enjoying every sip while doing so! Thank you to Joia Spirits for sponsoring this post! All views and opinions are of course my own. Thank you for supporting the brands that make Louella Reese happen! Hi! I'm Laura Leigh, a twenty-something year old with a love of all things feminine, chocolate, and a fabulous glass of prosecco! 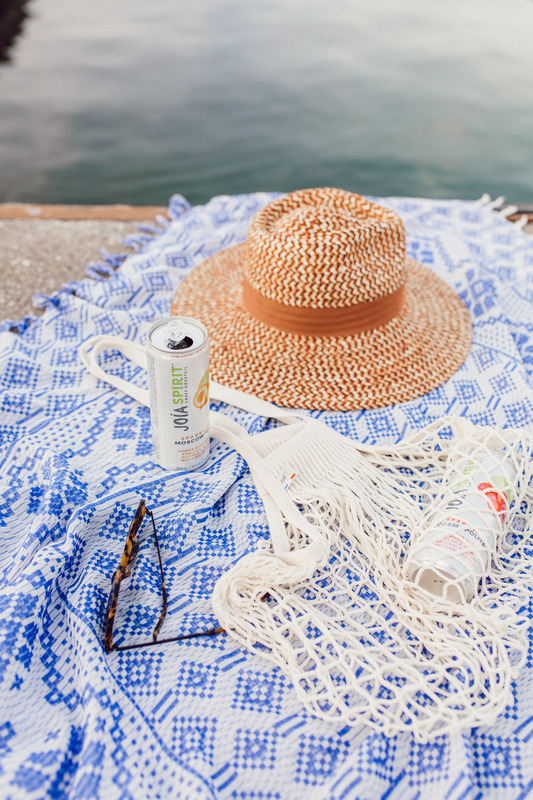 Louella Reese was created to be a source of inspiration that covers everything from fashion and beauty to travel and home. I hope you enjoy! Thank you so much Rebecca! My husband is definitely a trouper and even if he won’t admit it, he loves the spotlight 🙂 of course, thank you for checking it out! Mind if Coop and I join y’all for a date by the lake soon?! We’ll bring the Joia Spirits! Yes girl, let’s!! That’d be so much fun! And I know y’all will love Joia Spirits! We love going to NASCAR – really miss it since we moved from Vegas. It was so much fun. Love these date ideas!! Ah love it! You’ll definitely have to make a trip back soon to go to one OR come to Charlotte 🙂 Thank you so much – appreciate you checking out the post! What a cute post! I love these date ideas from both perspectives. Definitely using these ideas for my hubby (who is also a Josh!) and I.
I love this idea for a blog post!! A picnic in the park is my kind of date! Thanks girl friend! We had so much fun putting it together. Yes, with you on that! Oh I love a good spring hike! Thank you for the lovely ideas girl! As a newly single girl, these ideas are perfect! Ps, I’m dying to try that drink you’ve got — it sounds delish! Aw yay – happy to hear that! 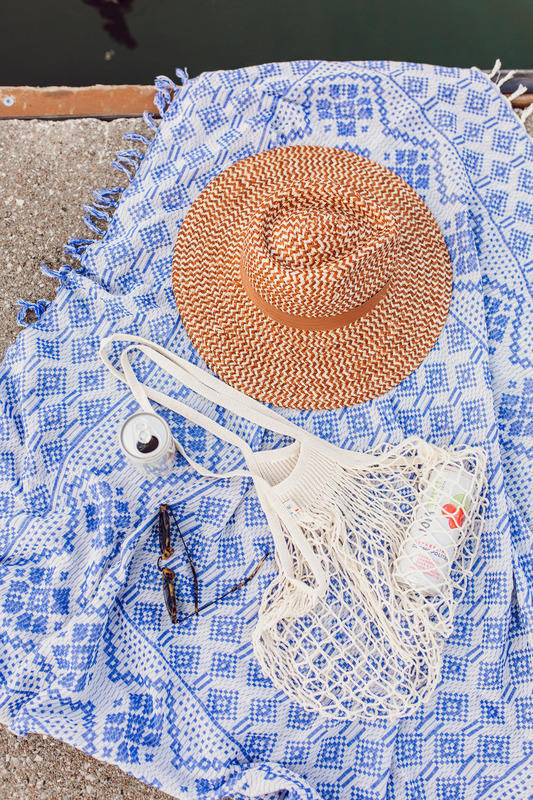 Yes, you need to – so refreshing! Such cute ideas! My husband and I are always looking for fresh ideas to spruce up our date nights. We tend to fall into the same routine of watching tv and eating pizza or chicken wings at home haha. But these sound great! And those cocktail cans are an awesome idea! Thank you Stephanie! With you girl, especially in the winter time – we tend to fall into a little date night rut. So we’re super excited spring has arrived and we can get outdoors and spice things up! Oh the cocktail cans are so refreshing! This is such a fun post. I may need to do this with my hubby. Thank you so much Courtney! Glad you enjoyed it! Love the idea of a picnic with the husband! They’re the best! So sweet and romantic. Plus a great way to enjoy the spring season! This is super cute! I love that Joshua helped you with this post, it’s fun to hear from the men about the dates he really wants to go on! Thank you Laura! So glad you enjoyed that part 🙂 I love having him take part in posts! I really needed a list of Spring date ideas and these are going on mine! I love the idea of visiting a garden this time of year, too. Oh perfect!!! So happy to hear that! Moscow mules in a can?? I need to try this! Love these date ideas! So cute that you came up with five and he came up with five. Thank you Deanie! It was so fun to get him involved and to chat about our favorites. Sign up today to receive feminine & casual with a classic touch style inspiration for every day life, your home, and your travels! Including daily posts and exclusive newsletters.